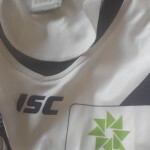 Numbers are worn on the back of your afl jumper, jersey , guernsey. It marks you as a member of the football team. Traditionally numbers were sewn on . Either hand sewn or machine sewn they were fabric and placed on the back . Mum got out the singer sewing machine and obliged . 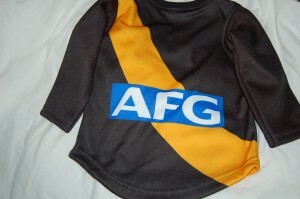 Today these numbers can still be seen on older jumpers , jerseys , guernseys. Then they were ironed on . This was a popular choice . Large sporting goods retailers sell them . Most people own an iron and know how to use it . 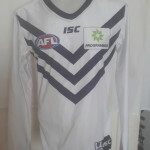 Placed and ironed onto the back of the jumper , jersey ,guernsey they look good.You can dream of playing like Chris Judd of Carlton Blues in his jumper with his number on the back. 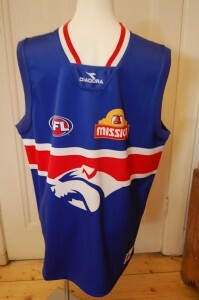 Lately they can be printed on the jumper , jersey , guernsey. Purchase a number thirteen jumper , jersey , guernsey from the St Kilda Saints to barrack for Adam Schneider . These numbers have the afl logo printed across the bottom of them. Who's got your number ? Whatever your number , wear your jumper , jersey , guernsey to the match. Why do we follow the teams we do ? Often , it is family tradition that dictates which team we support. when we we are young can decide who we will barrack for . A young man may barrack for the team they played with in an amateur league or at senior level who is affiliated with a particular afl club. Geographical location may dictate who you will barrack for .If you live in Carlton does it follow that you will go for the Blues? Peer group pressure and wanting to follow the same team as your friends might decide who you follow. Also if you want to go the footy you will go with fans of the same club , sit together and wear your similiar football jumper , jersey , guernsey . Clubs under threat of amalgamation , annihilation or extinction call on fans loyalty to the jumper , jersey , guernsey . The colours of your clubs jumper , jersey , guernsey can ignite passion and instill loyalty no matter who you follow . Its tribal , its colourful , its passionate and there is no more brilliant sight than a sea of fans in the colours of your clubs jumper , jersey , guernsey . Every supporter has a reason why they follow who they do . All are valid . 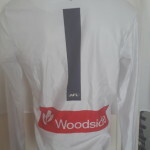 All fans look and feel good in their team colours jumper , jersey , guernsey . Dust the mothballs of Grandpa's old Geelong jumper. Wash out Uncle Bill's Essendon Jersey .Get your jumper you wore as a skinny teenager down from the top shelf and get to the footy . Your jumper , jersey , guernsey will enjoy going to the footy again .You will be pleased to evoke a few old memories of a bygone era if you can stand the overpowering stench of the mothballs!